IT has been a remarkable journey for California building industry legend Robbie Hunter ever since he left Belfast in 1978 to emigrate to the USA. Grandson of a docker, Robbie’s upbringing owes much to his current role as president of the State Building and Construction Trades Council of California, the umbrella organisation for 160 local unions covering 14 trades that represent in excess of 400,000 skilled construction workers, including 51,000 apprentices in the state of California. Robbie made his way as a teenager from Belfast to California to become an ironworker, working on various skyscrapers along the coast, including what would become Library Tower, the tallest building in California. Prior to his election to the State Council (his current role), Robbie served as executive secretary of the Los Angeles/Orange Counties Building and Construction Trades Council. Robbie cites a young Patrick McCarthy from Ireland to eventually becoming Mayor of San Francisco on two occasions of huge inspiration to himself. “Patrick landed in New York City as a 13 year-old from Ireland who worked on the canals in his bare feet during the winter,” he said. “He ended up as a carpenter in San Francisco where he formed a union. He looked at Sacramento, the capital of California and formed the State Building and Construction Trades Council of California, which I am president of today. Robbie also owes a lot to his great-grandfather, John Quinn, who helped organise a union in the docks to improve working conditions in Sailortown- a heritage Robbie remains very proud of indeed. “Everything I have done in America and every opinion I have was formed in Sailortown. Robbie Hunter was back where it all began for him last week- back in Sailortown and reunited with some old friends of the historic docking area of Belfast. 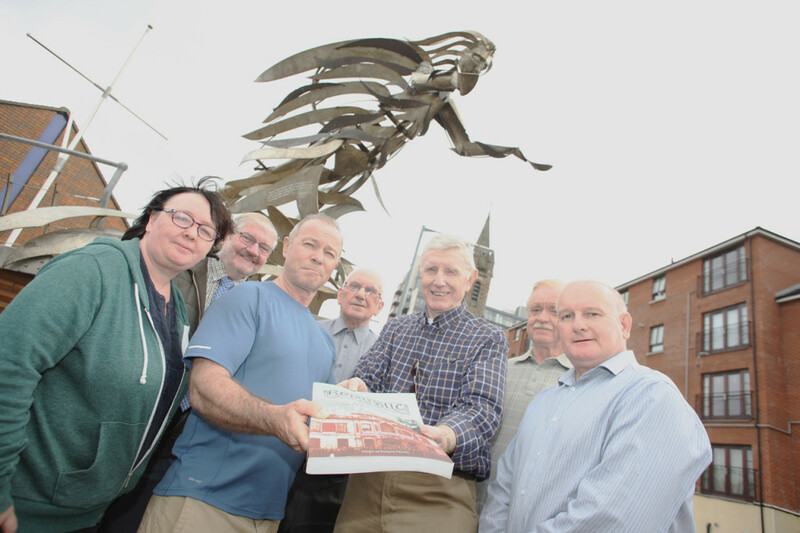 On Friday past at a ‘Tea At Sea’ fundraising event, hosted by Mission to Seafarers Belfast at the Flying Angel Centre in Prince’s Dock Street, Robbie was presented with a ‘Road to the Rising’ book – an account of James Connolly’s writings by members of the SHIP (Shared History Interpretive Project). Robbie also attended the Cultúrlann on Thursday to unveil a new stained glass window to Connolly – Robbie’s father was a personal friend of Connolly. “The presentation was tremendous,” said a delighted Robbie. “I see it as a gift to me from all the Belfast men who stood on the street corners when there was poverty in Sailortown. During his visit back home, he was surprised to discover the vast majority of workers at the Ulster University redevelopment project in Belfast city centre were not from Belfast – something he feels passionate about changing to benefit local tradesmen and their families. Robbie is urging local politicians to address the issue further, with great strides made already to date. “In America, for any project 60 per cent of workers must be from surrounding area. “We present a list of zipcodes to the construction company so that local workers are involved in a local project in their area. “I feel very strongly about trying to get rid of cheap labour. I was surprised by the lack of opportunities for young people in Belfast. As for the future, Robbie Hunter remains passionate about continuing to help provide fair opportunities for young people in the industry – something which he hopes to see improve back home in Belfast where it all began for him.